Hiking Boots, Trail Shoes, Shells (top and bottom), Hiking Pants, Shorts, Rain Gear, Sandals, Wetsuits, Tents, Sleeping bags, Sleeping pads, Dry Bags, Stoves, Pots/pans, Backpacks, Trekking poles, Fishing Gear, Bikes (20 inch and up please), Softball Gear, Climbing Gear, Cycling Shoes,Motocross Gear. Canoes, Kayaks, Paddleboards,. NO Cleats (we are stocked for the summer)!! If you would like to consign with us or have an account and would like to drop off more items, please read below where we go over the items that we can and cannot accept. Items are left with ChangingGear on a seasonal basis except for those items that are year round. Drop off anytime during regular store hours – during the week is better as Saturday is a busier day. All clothing needs to be in good condition, washed and no animal hair please. Why consign with us? All sporting goods that are that are brought in for consignment are cleaned with a Sani Sport Machine – this provides a clinically proven way to sanitize and kill any harmful bacteria – this means a cleaner and better selling item for your buyers. 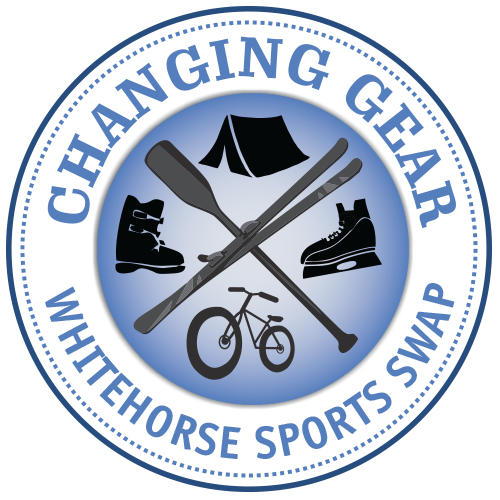 ChangingGear will become the first stop for people who are looking at different alternatives for buying sporting goods. ChangingGear will provide an honest and up front agreement and do it’s best to sell your gear in a timely fashion. You can bring all your different gear at once and not have to sell each item separately. Where and When do I drop off my items? Please bring them to our store at 91810 Alaska Hwy (just north off two mile hill on the Alaska Hwy ) next to the Bethany church – there is ample parking out front. Earlier in the day is a much better time for going through gear. How is my account set-up? We inventory everything in an itemized list that shows the items and their associated prices. Your account is assigned a unique Consignor number and you will be given a web password that you can use later on to check the status of your items. All items that are inventoried display on the online inventory after they are entered into the system. If there is time it will be the same day. Can I take items back? Processing, displaying, photographing and overall management of your account is very time consuming. For these reasons we ask that you leave your items with us on a seasonal basis but understand that different needs arise – please contact us about your item. Are items discounted over time? Clothing items such as Jackets and shirts are put on a reduced pricing schedule – 10% price reduction every three weeks for 120 days until the item reaches zero. There are special circumstances to the reduction please ask if you are concerned about your item losing too much value. NOTE: In the event that an item drops to the 90% discount price the customer forfeits any rights to ownership and ChangingGear may deal with each item as they see fit, generally through donations to local groups. You may pull an item from the store at any time BEFORE the price reaches zero. This information and price reduction will be visible on the webpage and the finalize date is also visible – the finalize date ONLY applies to items on a discount schedule for all other items we consign seasonal and will hold items throughout the season. What happens at the end of the season? An email will be sent out to all consignors about a week before the end of the summer and winter season with some timelines for how to pickup any gear that hasn’t sold. If upon consigning your goods to ChangingGear you made a preference for donation then these items would be donated to the charity of your choice. If you do not pick up your items and you did not specify a charity then ChangingGear will donate or dispose. How do I get paid? Depending on the value of your item you will receive either 50% or 80% of the purchase price, upon sale. The money that you make as people buy your items keeps growing in your account. You can make a purchase from your account anytime, be paid in cash or by cheque at the store. ChangingGear does not mail cheques. If you are in the communities ChangingGear can arrange for a Electronic Money Transfer but there is a $1.00 charge. Every August 1st the balance of your account is changed over to store credit – this is necessary for bookkeeping purposes – we will send out several notices of this happening beforehand. Basically the account resets itself – if you sell an item on August 2nd your cash bank will start over till the following August. Bikes – Gears must change, brakes must work and tires need to be full please. All downhill bindings are checked against the manufacturers indemnification list and if the binding is not on the list then the manufacturer has removed “support” for the binding and ChangingGear will not accept these bindings.This applies generally to older gear. Winter Outerwear – Clean,zippers working. We do have a ‘rack of no expectations’ whereby we can accept quality outwear that has a rip or stain but otherwise still functions well as a campfire type coat – we are very particular about what we will accept for this rack. Please ensure that hockey helmets have a certification date of 2009 or newer – we cannot sell any helmet older than 2009. Cross Country ski’s / poles / boots – we will accept all year but may not display until season is right. Any items with mould – especially on hockey gear or personal flotation devices. Clothing items that have not been washed or have excess animal hair. Items that have a company logo on them or souvenir clothing will not be consigned. *We reserve the right to refuse any item that is considered unsaleable.